Since it rhymes, July is the sci-fi month! It started in June with the release of the first Star Minds Lone Wolves book, Adventurer. Then comes Pilot and mid-month Hacker. 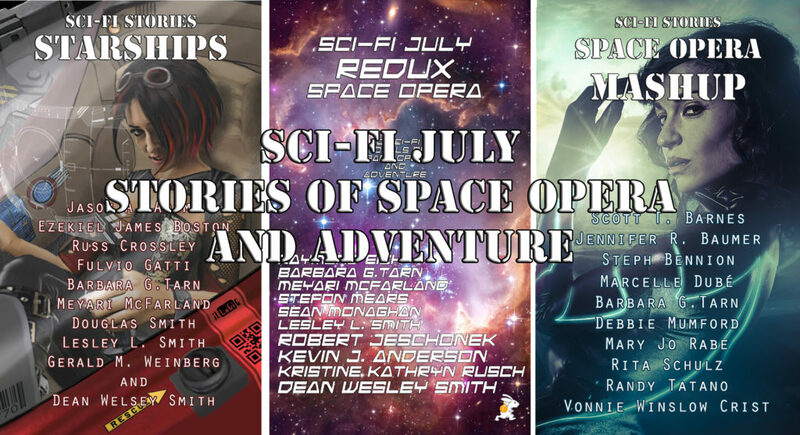 And we have a new bundle that will last approximately six months: Sci-fi July Redux! Space opera from great authors. Ten novels, some longer, some shorter, of space opera and adventure by Kevin J. Anderson, Raymund Eich, Robert Jeschoneck, Barbara G.Tarn, Stefon Mears, Meyari McFarland, Leslie L. Smith, Kristine Kathryn Rusch, Sean Monaghan and Dean Wesley Smith. We also have two anthologies of short stories: Sci-fi Stories – Starships and upcoming Sci-fi Stories – Space Opera Mashup. All ebook-only at this time, paperbacks for the single titles will be in the works during the summer.